It wasn't that long ago when comic books were considered junk, the kind of reading material you hid from your parents and teachers. But that's not the case anymore in some schools in Maryland, reports The Early Show national correspondent Thalia Assuras. Comic books are being taken quite seriously in those schools, which are taking part in an experiment in which comic books are used as a teaching tool. Some of the comic books, Assuras notes, aren't even funny. They're storybooks with pictures, or graphic novels. One student tells Assuras she "thought it was crazy" when the teacher pulled out comic books. But the student says she also thought it's "going to be really cool that we're going to be able to read comic books instead of books. I thought it was just for free time." 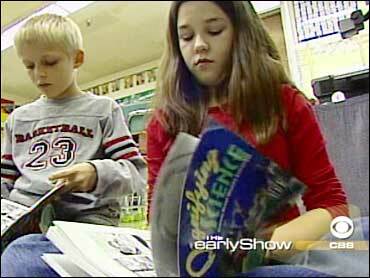 School officials are hoping comic books will help improve reading proficiency, especially among boys. In elementary and middle school, their reading scores are 10 percent lower than those of girls, and 12 percent in high school. The pilot prgram is the brainchild of Maryland's superintendent of schools. Nancy Grasmick says graphic novels motivate reluctant readers. She emphasizes they're used to supplement -- not replace -- traditional reading material. "This is something that is pleasurable and motivating and yet, embedded in that, is an increase in vocabulary from reading, anticipating plots, Grasmick points out. "There are a lot of good skills embedded in this." Including writing: Students also create their own comics, drawing and, most importantly, learning how to shape a story. "Now that we're doing comics," one teacher tells Assuras, "they start off with the same writing process they would go through with any other piece." "I can see the potential," concedes teacher and literary expert Carol Jago, "but I think there's also a terrific danger" that teachers will rely too much on comic books. Jago, who's with the National Council of Teachers of English, complains, "As soon as a student starts moaning a little bit or looking unhappy, they change the book. Look for something easier. Look for something shorter. …They're trying to find something palatable…instead of changing that dynamic and saying, 'Reading's hard, and I'm going to show you how to do that.' "
The program is being tried in fewer than 10 percent of Maryland's schools at the moment. But by this fall, a curriculum that includes comic books is expected to be available to all the state's schools, though it won't be mandatory. When asked by Assuras, the students resoundingly agreed that they really are learning by reading the comic books. Fifth-grader Jad Kitts says, "You're learning to understand the story better in a different way." Fellow fifth-grader Brandon Semilia agrees: "You're learning about achievements in the world." While the students are convinced the comic books are a real plus, the educators still aren't so sure. They'll be studying the reading scores over the next several months before issuing a report card, Assuras says.